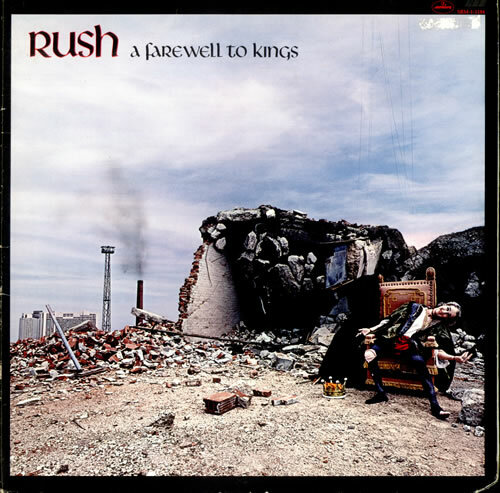 RUSH A Farewell To Kings (1977 US issue 6-track vinyl LP, the 5th studio album including the epic Xanadu featuring early keyboard exploits for the band, the set regular sing-a-long single Closer To The Heart and the lesser played classic Cygnus X-1, gatefold picture sleeve featuring the well-known puppet artwork by Hugh Syme, complete with lyrics and band photo on the inner spread [featuring those Peart boots!] and original picture inner later immortalised on many a poster with the starman logo on the other side! The sleeve has a deletion cut corner and displays some light visible signs of wear/corner wear but is otherwise intact and in excellent shape, whilst the vinyl shows some light evidence of play. A nice example of this great album from the Rush early days! SRM-1-1184).